يقع Santa Fe Hotel في تاموننج, جوام, هو خيار شائع بين المسافرين. يقع مركز المدينة على بعد 2.8 km فقط. ويمكن الوصول إلى المطار خلال 5 دقيقة. كما يمكن الوصول بسهولة إلى ‪Sapphire - Day Tours‬, Guam Premier Outlets, Cancer Center Of Guam. إن الخدمات التي يقدمها Santa Fe Hotel تضمن للنزلاء إقامة مريحة. يقدم الفندق واي فاي مجاني في جميع الغرف, مكتب الاستقبال على مدار الساعة, مرافق مخصصة لذوي الاحتياجات الخاصة, واي فاي في المناطق العامة, صف السيارات لضمان الراحة القصوى لضيوفه. استمتع بوسائل الراحة الراقية في الغرف أثناء إقامتك هنا. بعض الغرف تتضمن اتصال لاسلكي بشبكة الإنترنت (مجاني), غرف لغير المدخنين, مكيف هواء, خدمة الإيقاظ, مكتب لمساعدتك على استعادة طاقتك بعد يوم طويل. يقدم الفندق مجموعة رائعة من الخدمات كمثل مركز للياقة البدنية, حمام سباحة خارجي, رياضات مائية (غير آلية)، لجعل إقامتك تجربة لا تنسى. يشكل Santa Fe Hotel بخدماته الراقية وموقعه الممتاز، قاعدة مثالية للاستمتاع بإقامتك في جوام. The Santa Fe Hotel is a very nice place, however it needs some upgrades----The phones in the rooms do not work, furniture and drapes very old and laundry room only has one washer and dryer. All the staff very helpful and friendly, Benny at the front desk was always willing to help a very good person. Mercy in house keeping did a great job taking care of my room. The Santa Fe Bar and Grille was great, right by the beach the food was great and the staff very friendly. Keilani at Reservation was very helpful getting me checked in cause I arrived early and when I had to request two more days due to the typhoon. Overall I had a great time and yes I would stay their again. Great little place at a good rate. Stay on the beach, eat on the beach, bar on the beach, nice little pool. Cant beat it for a friendly staff and affordable rate. Breakfast is worth it for sure. Run on the beach and close to all. Great restaurant in the hotel and next door. Water park and grocery store next door as well. Stayed at Santa Fe Hotel (SFH) during a huge typhoon hit to Guam. The staff were very professional, patient, and replied to my request very quickly. Which level of expectation that is very difficult to get at any other 3 star hotel. Even during the typhoon there was almost no power outage, slightly couple of seconds. Size of the room was good enough for a single traveler or two, maybe a little tight for a family. Wi-Fi worked well, amenity goods were satisfactory. First there were no microwaves or water heating pot, but staff delivered them to the room right after requesting. Needed to ask to bring new towels couple of times. Small convenient shop available on first floor. Supermarket is located in a walkable distance, nice restaurant next to hotel, also GPO is in a 20 minutes walk distance. Whenever need a ride to downtown area you just need to walk 2 minutes to Onward Hotel next to SFH and catch the red shuttle bus. The beach behind the hotel was astonishing! 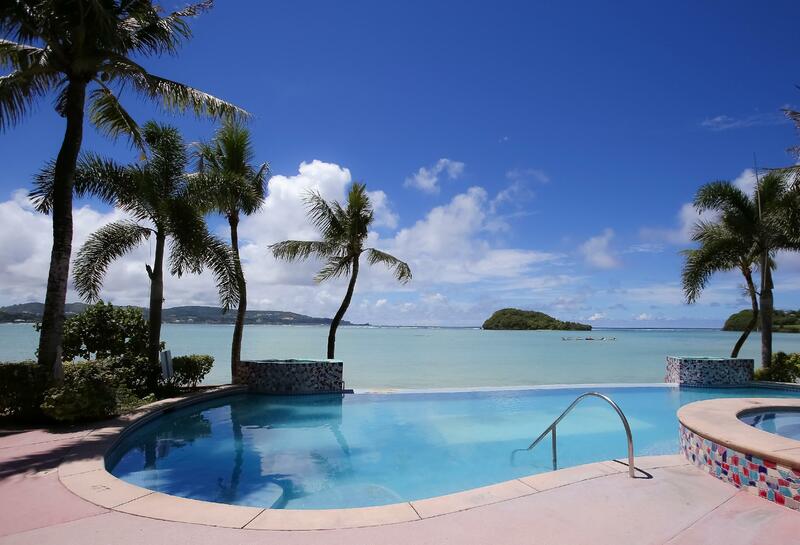 Don't miss to stay in Santa Fe Guam, If you choose this hotel ,you'll have super time in Guam. The beach is okay, water clear. No water sport activities. The water park of the neighboring Onward Hotel is totally overpriced. Super market not far away. The restaurant is nice situated just at the beach, but the neighboring Shirley’s restaurant got the better food and more friendly staff. PROS: -Great front desk service. -A/C suuuuuuper cold (i love it!) (You could always change the temperature if you don't like it super cold) -QUIET! Major plus. -Having breakfast RIGHT BY THE BEACH is awesome! Sunrises and sunsets are amazing! CONS: tube t.v :( Other than the dinosaur t.v. awesome stay! Overall, very nice. Small, friendly hotel that’s showing its age. A few, petty annoyances kept it from getting an excellent rating. The television in the room is from the dark ages, no glasses or towel racks in the bathroom. The WiFi was on-again, off-again. On the plus side, beautiful beach location. Everything in the hotel is very convenient. Food at the beachside grill is very good. Ample parking close to the building. Very courteous and helpful staff. The hotel was in a nice location, but for three of the four days we had no hot water...they were waiting for a part. The hot tub was also closed for repair, and all the phones were not operating. They said this was also being fixed. Staff were helpful, and cooperative as much as they could be. Food was more expensive than expected at the restaurant. They also charged $15 for a short ride to a shopping area. The water at the beach is very shallow, even if you go out far, so not very conductive to swimming. The jet skis were $150 for a rental. Water was clean, however. - extreme dirty room e.g. blood stain on bed, floor full of dust and debris etc. - no phone in all rooms of the hotel, according to the reception said. - no hot water for shower for almost all our stay - decoration picture fell down from the wall and nobody fix during all our stay - the shower was basically broken and the hotel just ignored it. - the toilet was partially blocked. - no double bed, just two single beds paired up together - just one towel in the room at the beginning. - tiny old fashioned TV with blurry screen. - no water boiled facility - the worst hotel/motel I have ever seen, according to my hundreds of hotel/motel living experience. - absolutely worst than a no-star cheap motel next to a highway. - most of the good reviews from the websites about this hotel are fake! Be careful! - Again, never stay here because it will screw up your holiday. - In short, this hotel is just a trash. I fail to understand how owners of a hotel with so much commercial potential and a great beach location would not reinvest money into the property. The problems with this hotel are so immense I could write a book but other reviews will give you a good insight. The best thing we can do is choose other places to stay and hopefully make the owners wake up and either do a major renovation or sell the property before it is no longer feasible to renovate. Sorry nothing positive to say but hope others will read my review before choosing to stay at this hotel. Thanks for reading..
Place was disappointing, sink had bad scum staff wouldn’t clean it. Better places in tumon. My friend and I stayed here for 5 nights and we had a great time! Thumbs up to all staff! They were very attentive, provided our needs, they were quick to upgrade us (with no extra charge) from the garden to the beach view room since the AC from the former room was leaking. The Filipino staff in the Grille were all friendly. Thank you for your hospitality! The location was great. It was on the beach, near the bus stop, GPO, and restaurants! The facilities can be improved, bathroom was clean but tiles had molds. Also, website said check in was at 2:00 pm but we were only allowed to check in at 3:00. Please correct this to avoid frustration from visitors who are already exhausted from their flight. Over all, it was good. Great value for money. Great room and bed for the money. Got the Oceanfront Suite, breathtaking Sunsets all 3 nights. Nice Bar & Grill on premises. Shirley's Restaraunt right next door. Highly recommend this place. Not in the heavy Tourist mecca of Tumon. Quiet but still close to everything. And it's the only locally-owned beachfront hotel on the island. We had a pleasant stay in this hotel. The room was okay as well as the facilities. The Wifi has weak sgnal. It a bit far from the main city thoroughfare and had to travel by cab to visit the places we wanted. But its a good location nonetheless if you want to just relax and go less on shopping. We had a wonderful time at the hotel. The staff were very friendly, very helpful and very accommodating! The beach during sunset as seen from our room was so breathtaking! We had a most relaxing five-day stay at Santa Fe! I've stayed at the SFH several times & will again. The location, setting, price & staff are great. I love to sit on the patio with a glass of wine & watch the sunset. The rooms are large & comfortable & the price is right. But it's in dire need of updating. The towels are worn; the room carpeting needs to be replaced; the TVs are old and bulky with few stations; the phones have never worked (with cell phones, why leave them in the rooms? ); the washing machine & laundry room need to be cleaned; the rooms' entry ceilings often drip from AC condensation. I have never stayed in a room at the SFH that did not need work in the bathroom, especially the showers that need new shower heads, caulking, etc. I got what I paid for at $68/night. But I would pay more if the rooms, towels, amenities were upgraded. I hear the owner is trying to sell. Perhaps he's hanging on until he finds a buyer. For now, the location, setting, price & friendly, responsive staff are why I stay and will again. Great deal for your money! Staff was helpful and location is fine; on Guam nothing really is that far. It was close for us to visit family and do tourist things. Love how it was mostly quiet (exception being last 2 days some teenagers were in the room next to us using profanity and sounded like they were fighting; the room phones weren’t working, so luckily used a cell to call front desk and they sent security up, they quieted and left, but when they came back we’re still noisey) and was right on the beach. The only issues are facilities need to be renovated a bit. Our room toilet seat was peeling and very stained, pool was missing tiles and needed a cleaning (looked like algae was growing on walls) and being so close to the beaches I needed to wash our clothes and swimwear but there was only 1 washer and 1 of 2 dryers working. WiFi password stopped working 2 nights before check out and called for a microwave But they never found one I guess. Would try again, hopefully it’s better.